Mumbai : First Indian skipper Virat Kohli rocked on Day 4 with a smashing double ton, his third this year, and then spinners weaved a web to put India on verge of victory. Virat Kohli slammed career-best 235 at the end of the fourth day of the fourth cricket Test, taking India to a handsome lead of 231 runs against England. In reply, England were left tottering at 182 for 6 needing another 49 runs to avoid innings defeat as the hosts are now all but assured to regain the Anthony De Mello Trophy that they had lost back in 2012. 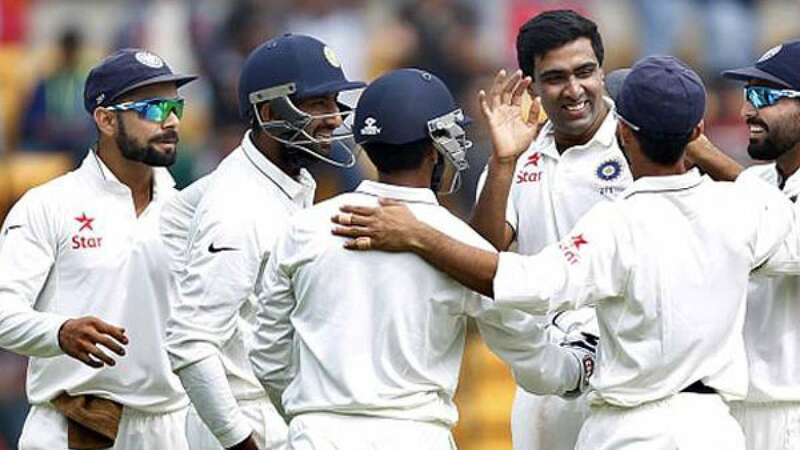 Ravichandran Ashwin (2/49), Ravindra Jadeja (2/58) and Jayant Yadav (1/39) shared five of the six wickets. The other wicket-taker was Bhuvneshwar Kumar (1/11), who removed first innings centurion Keaton Jennings (0). Jayant Yadav became the first Indian to hit a ton in a Test match at number 9 position.